So much yarn, so little time. : Caption Winner! Lots of fabulous captions, thank you everyone who entered. Some of you forgot to say which of the cards was your favourite - I know, it's so hard to choose! 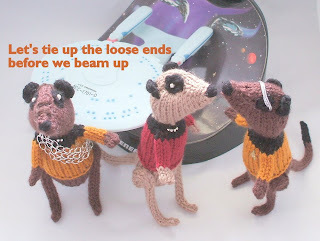 Particles of Stone chose "To boldly kiss" as her favourite card and gave us the caption "Let's tie up the loose ends" ... not my favourite part of any knitting project I must confess! I shall tweet you in your StoneDragonfly persona and wait to hear what you'd like to spend your free £5 on! Cute caption! It will be great on that card! Congrats to the winner!